Construction Loan Manager (CLM) sets the foundation to launch your construction loan portfolio to the highest levels of profitability. By seamlessly integrating with any core system and automating almost every aspect of the construction loan process, one person can oversee hundreds of construction loans. Construction Loan Manager delights builders, sub­contractors, examiners, and board members with technology that instantly processes interest reserve payments; generates–on demand–detailed statements and documents; allows disburse­ments to be distributed immediately and with the highest accuracy; maintains a detailed loan history and much more. No other system gives you the full range of tools and controls needed to succeed in the construction lending industry. 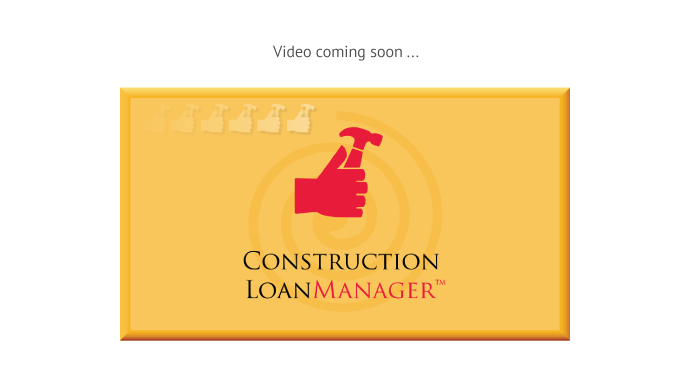 We’ve utilized Construction LoanManager (CLM) for three years now. This product allows us much more efficiency in month-end reporting, audits, and overall draw monitoring and disbursements. All the information you need is in one database. CLM is very user friendly and has given us the ability to expand our portfolio without having to hire additional FTEs.